There is so much discussion about promoting products and services at events, and that presents both a challenge and an opportunity to advertisers. In marketing, going with the flow is regarded as a good option. However, there is an overwhelming competition for attention there. What you can do is enhance and intensify your presence efforts through exhibition designs. Engagement in an event forms part of the above-described marketing approach. There is still competition in such an event, but at least you dont have to deal with thousands or even millions of competing businesses. To make sure your high visible exhibition design rises above the rest, you could implement the following suggestions. Stand designs are usually classified into five namely: peninsula, head, corner, walk through and row. A peninsula stand is open in every area while a headstand includes a backdrop in one side but is open in three sides. Corner and walk through stands have two open sides as well as walled sides. In a corner stand, two walls are adjoined together, forming a corner. In a walk-through stand, the two walls are set up across each other, providing a pathway. A row stand has only one open side. When choosing from the specified designs, you have to think about the location of the area around your booth. For booths with spacious areas, a peninsula stand is considered the better option. A row stand provides privacy and exclusivity, which is handy if there are booths beside and behind. A corner stand works well if your booth is on a corner or beside a structure. You can also make use of a double-deck stand if your organizers and also the venue allowed. With this, you can mix and match different stand layouts. One of the most efficient ways to outshine your competition is to keep your high visible exhibition stand design is well-lit. You do not want your exhibition stand to be treated as a shadow or backdrop of other stands, do you? Instead of opting for standard cold lighting, ask your stand provider to use worm lights or modern Led lighting. Aside from lighting systems, a way of brightening up your stand is featuring LED screens. These tend not to only lighten up your stand they may also be means to feature your video ads, instructional videos, and customer testimonials. As a way to determine the role, an exhibitions stand design play when compared to other communication tools and instruments an organization must take two key elements into account: the level of dialogue and face-to-face communications and the input the senses receive during communications. In a sender-dominated display and communications scenario intensity levels are especially low. However, they increase with the usage of media contained in the dialogue, e.g. with electronic media, concluding in a personal meeting and a conversation, for example on the stand. Intense targeting of the senses begins with the relaying of abstract information and increases with the use of a multimedia experience, e.g. an audiovisual dissemination of information and facts, culminating in a face-to-face encounter, in which information is accepted by all the senses. Is your brand name recognizable in several distances? This is a question you should ask your stand provider. Whether you utilize blocks of letters, overhead banners, or moving graphics display, make sure everything is bold. This way, your brand name and tagline can be viewed by event-goers even from afar. 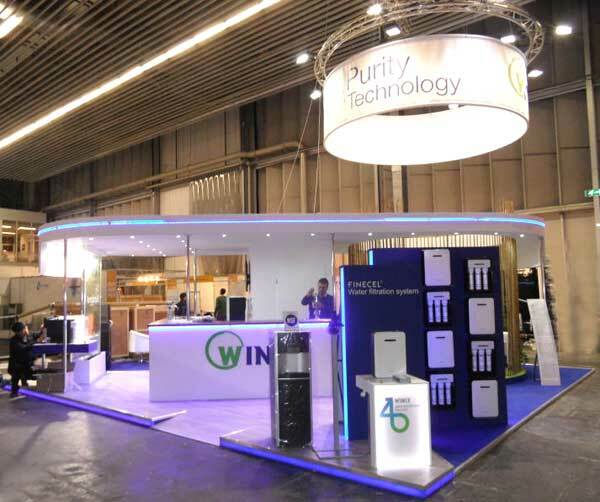 For the new competitive Age, using progressive design and innovation to help customers display there products and services and make key business exhibition design marketing actions is a challenging task. If you can not afford such sophisticated customization, you can focus on having more simple structures using wallpaper artworks and renting LED screens instead. Your attempts should not end at putting up a high visible exhibition stand though. It’s also advisable to designate your people to different parts of the venue. Provide them logo-bearing shirts so event-goers can recognize and associate them to your brand easily.